Looking for some ways to keep your older dog fit and active? From the importance of your daily walking routine to low impact exercises suited for dogs with mobility issues, here’s 10 tips for exercising a senior dog. When it comes to exercising a senior dog it’s a good idea to schedule an appointment with your vet before changing their routine. It’s a good idea to write down your questions and concerns before the appointment to make sure you don’t miss anything; I can’t even tell you how many times I’ve said “I forgot to ask about that” after an appointment. Your vet will be able to access your dog’s condition and help you come up with an exercise routine that’s suited for your dog. 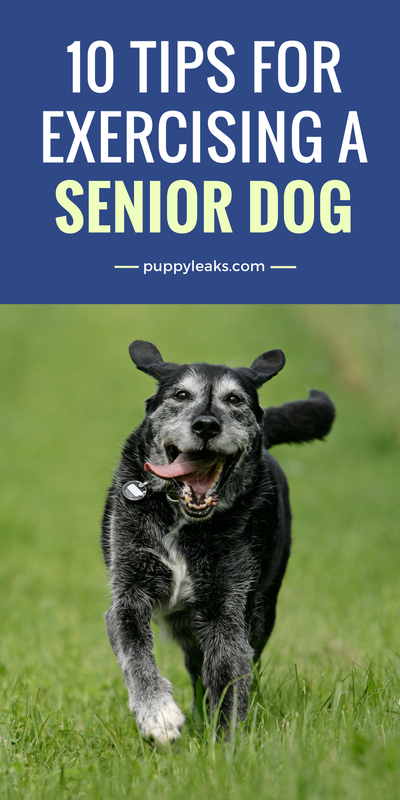 A daily walk is recommended for all dogs, and senior dogs are no exception. Your older dog might not be able to go on a four hour hike with you anymore, but they can still enjoy a nice stroll around the neighborhood. If things start to get a little mundane you can make your dog walk more fun by letting your dog be the navigator or taking regular sniff breaks. If your dog is out of shape or has any mobility issues remember to take it easy by sticking to flat surfaces (such as a neighborhood walk versus a hilly trail) and increasing your distance over time. Tip: If you’re having trouble sticking to a regular routine here’s some tips on motivating yourself to walk the dog. When it comes to exercising a senior dog remember to take it slow when starting a new routine. Like us, our dogs can over exert themselves when exercising, and that’s especially true for dog’s that are out of shape to begin with. Remember to take it slow and increase their activity over time to help avoid injuries. If you’re starting a new walking routine with your dog start on a flat surface and slowly increase the distance and/or pace over time. If you’re adding in some new activities to their routine (such as swimming or a game of fetch) keep track of how long they’re active for, and whether or not they’re showing any signs of discomfort afterwards. After a few sessions you’ll have a pretty good idea of how much activity they can handle, and you can start building that up over time. When it comes to adding exercise to your senior dog’s routine remember to take it slow. Endurance & stamina are built up over time. 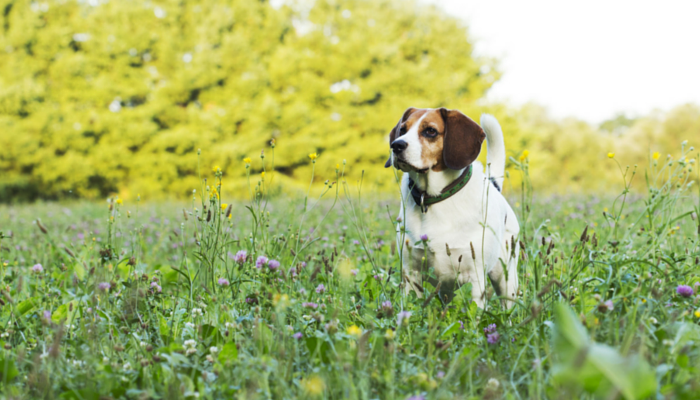 Progressive increments can help your dog avoid injuries & over exertion. One of the most important parts when it comes to exercising your dog is to start with a warm up. My dog Laika is really stiff in the morning due to her arthritis, so before we venture out on our morning walk we take a few quick laps around the yard to help loosen her up. If your dog has any mobility issues such as arthritis start your exercise routine with a 2 or 3 minute walk around the yard to help get them moving. 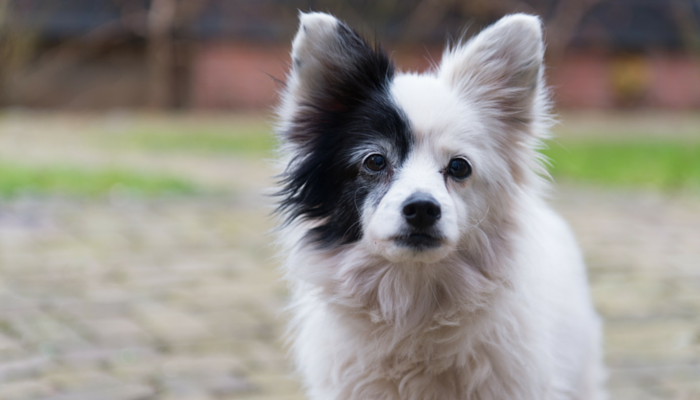 80% of dogs have arthritis by the time they’re 8, so managing canine arthritis is something many of us will have to do at some point in our dogs lives. It’s not a diagnosis anyone is happy about, but it doesn’t mean all the fun activities you once enjoyed are over. Low impact exercises, such as walking and swimming, are great for dogs with mobility issues such as arthritis. If your dog has any mobility issues stick stick to low impact exercises such as swimming, walking, indoor games and gentle play sessions. Those types of activities can help keep your dogs muscles strong while being easy on their joints. Dogs with mobility issues should avoid high impact exercises such as jogging or intense games of fetch that rely on running and jumping. One way to keep your dog active in their older years is to supplement their exercise routine with some added mental stimulation. Simple nose work games such as find the treats or a quick game of hide and seek will keep your dog’s brain engaged while also encouraging them to be active indoors. Throughout the day add in a few extra games and activities for your dog to enjoy indoors. A few easy ways to give your dog some more mental stimulation is by giving them a puzzle toy, a stuffed Kong, playing a game of hide and seek or letting them sniff around and explore while out on your daily walk. Add in some mentally stimulating games to your dog’s routine to help keep them fit and active. Using food dispensing toys, playing nose work games and letting your dog take “sniff breaks” on walks are good examples of some of the mentally stimulating activities you can add into your dog’s routine. When starting any new exercise routine with your dog be sure to watch out for any signs of discomfort or pain such as limping or wanting to stop or slow down. If your dog exhibits any signs of discomfort give your dog time to rest and adjust your routine as needed. Dog’s don’t typically whine or cry when they’re in pain, so it’s important to keep track of their body language and behavior when starting a new exercise routine. If you have any questions or concerns consult with your veterinarian; they’ll be able to point you in the right direction when it comes to accessing what level of activity is appropriate for your dog. When it comes to exercising your senior dog remember to be consistent; a 20 minute walk each day is better than a 2 hour walk on the weekend. Dogs that don’t get regular exercise are more likely to injure themselves over dogs who get regular exercise every day. And when I say be consistent I don’t mean you have to do that exact same thing everyday (although if it’s enjoyable there’s nothing wrong with that), it’s more about keeping track of the intensity and amount of exercise your dog gets everyday. The routine itself can be mixed up to keep things fun and interesting. You can take a new route for your daily walk or play fetch at the park rather than in the backyard. If doggie brain games are part of your routine alternate them; play find the treats on Monday, hide and seek on Tuesday and trick training on Wednesday. A nice 10 minute dog massage can help soothe your dog’s muscles after exercising by decreasing stiffness and pain, lowering blood pressure and improving circulation. Using a flat palm I use gentle, slow strokes with my dog Laika. She absolutely loves it, and it’s an easy way to help her calm down and relax after exercising. When it comes to exercising a senior dog finding the right balance is key. If your dog is used to going for a 20 minute walk each day try adding an extra 5 minutes to the routine, or add in a quick gentle play session every evening. Keep track of your dog’s behavior afterwards watching out for any signs of pain or discomfort, and slowly increase their activity over time. For dogs with mobility or joint issues such as arthritis you’ll want to stick to low impact exercises such as walking and swimming. For my dog with arthritis the right balance for us has been a combination of low impact exercises plus plenty of mentally stimulating games. Write down how much exercise your dog is getting every day, and adjust as needed. If your dog is showing any signs of discomfort slow down a bit and readjust. And as always if you have any questions of concerns don’t be afraid to check in with your veterinarian.